Clint Eastwood’s soft, almost beautiful face as a young actor belied the macho man who would one day snarl out, “Go ahead, make my day.” Even the most diehard fan would be amazed to know that he actually posed for “glamour-boy and beefcake shots” early on in his career. In the pages of this mesmerizing book, that beautiful, glamorous face quickly changed as he began to snarl through his early spaghetti westerns, Rawhide, and culminated in the grizzly faced, explosive characterization of the rogue cop. 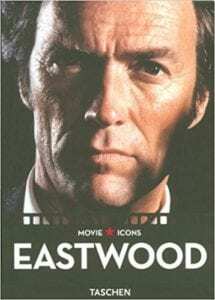 He adopted a demeanor that could chill anyone as he played the character Harry Callahan, yet he was a man of few words. In the seventies, Eastwood, the perennial cowboy began to branch out. Characters the likes of Harry Callahan were born, he began making films with his future partner, Sondra Locke, and he even found a beer buddy named Clyde. Every Which Way but Loose (1978) was a phenomenal hit and undoubtedly paved the way for him to express himself in film any which way he chose during the next three decades. The mold of the tough guy was broken and Clint Eastwood became an American film icon. In this dazzling series, Movie Icons, we first explore Clint Eastwood’s mythic machismo with a brief overview of his career. The visual filmography, with captions in English, French, and German, is filled with stunning art photography, both in black and white and full color. There is a wide array of movie stills, candid shots captured on movie sets, and portraits. A chronology, filmography, and bibliography nicely round out this visual feast. This book is an excellent tribute to a great American icon, a book that you’ll want to browse over and over again! Quill says: Anyone who has ever seen Eastwood’s Man with No Name act, is undoubtedly going to want to browse this book. The “Man” is beautifully portrayed in this photobiography as he was...a legend and Hollywood icon.